From the Register of Plum Blossom Portraits, Song Boren, 1238. Introduction: The Register of Plum Blossom Portraits (Meihua xishenpu, hereafter the Register), initially printed in 1238, is the earliest illustrated book on the subject of plum blossom appreciation. The earliest extant Register was a reprint made in 1261 and it had been endowed with great significance since its rediscovery in the late eighteenth century. Not only did the surviving copy reinforce the status of plum blossom as an important subject in the pictorial tradition, but it also offered an opportunity to explore the historical impacts of woodblock printing during the Song Dynasty (960–1269). The Register presented one hundred plum blossom pictures, all titled and inscribed with five-character quatrains (wuyan lüshi) composed by the artist and author, Song Boren (b. 1199, courtesy name Qizhi, studio name Xueyan). 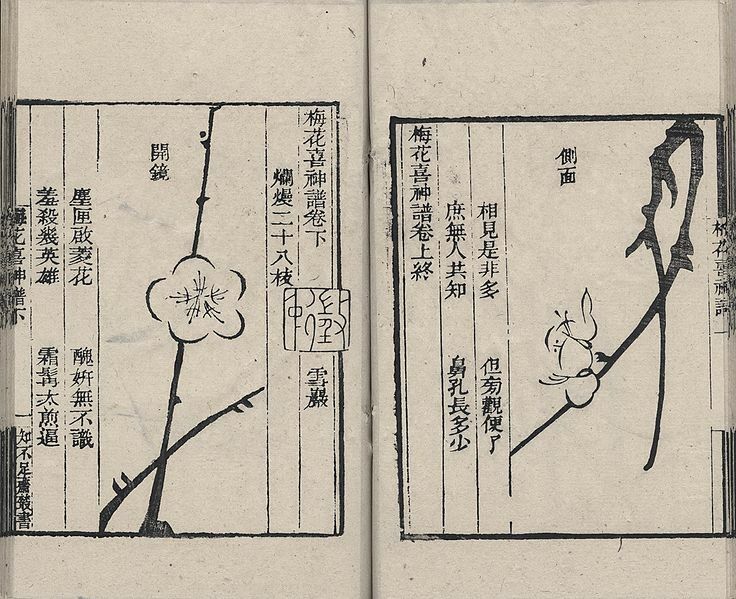 Noticeably, the juxtaposition of image and text suggested a particular mode of viewing printed plum blossoms as visual analogs, through which the flower’s formal character was highlighted and integrated into a larger visual environment. The Register’s unique design principle raises several questions. Why did Song Boren adopt this compositional strategy and what kind of meaning did he intend to generate for the historical viewers? What role did the print medium play in the making of the Register? What was the point of associating plum blossoms with other things based on their formal resemblance? Attempting to answer these questions, this thesis examines the Register as a designed artifact, a physical embodiment of the convergence of authorial, technological, and conceptual agencies. Particular attention will be paid to the making of the plum blossom visual analogs, which marked an important shift in the Song dynasty visual culture.